I can think of two good reasons to make all my own bread. The first is so that I can control the ingredients and the second is that homemade bread doesn’t come in a plastic bag. I have had a bread maker for a couple of years now, and when I first got it I tried to make enough bread to get us through the week, but at the time it was all too much. I was working, blogging, starting to change my life in so many ways and the constant bread making was just a step too far. Recently my youngest started pre-school and having a bit more time on my hands I have started thinking about making bread again. One of the things that I found the hardest about making my own bread was slicing it. It just felt like hard work both in the actual slicing action and trying to get even slices. Another problem is that it doesn’t stay fresh for long, so to have fresh bread every day I felt I needed to be constantly baking it. So to solve the problem I decided to a) get a bread slicer and b) freeze the sliced bread to stretch out its life so that I don’t have to bake it as regularly. It also means I can make sure nothing goes to waste. 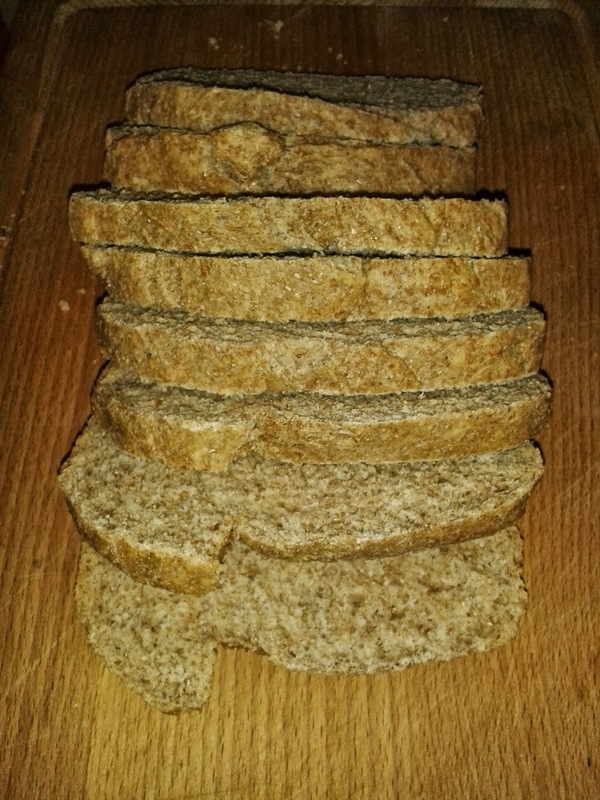 A while ago my mum gave me the great tip of freezing sliced bread at an angle, which then makes it much easier to separate out the slices once frozen. It has no plastic parts to it. The wood used is FSC certified wood. If a part breaks you can buy replacement parts without having to ditch the whole product. It is designed and manufactured in the UK – not far from me in Hampshire by a lady called Judy who saw a gap in the market for a really good quality bread slicer. I contacted the company and asked if they would be interested in sending me one to review and they said they were happy to send me one that had been damaged slightly in transit. It had a little nick in the base and the metal slicing guide had been bent out of shape a little. I thought this was great as they wouldn’t have been able to sell it, but weren’t letting it go to waste either! I have to say I haven’t noticed any problems with the slicing guide at all. I found that it fitted my bread machine loaf perfectly and really does make it so much easier to slice the bread. If I could make one change it would be to make the slices slightly thinner but the slices are a massive improvement on my attempts to slice a loaf without the help of a bread slicer. Depending on the ingredients you use, making bread may not necessarily save you money and adding the cost of this bread slicer to it isn’t going to help matters. However if you want to make your own bread in the long term for reasons other than financial ones, then I would say that it is a good investment. 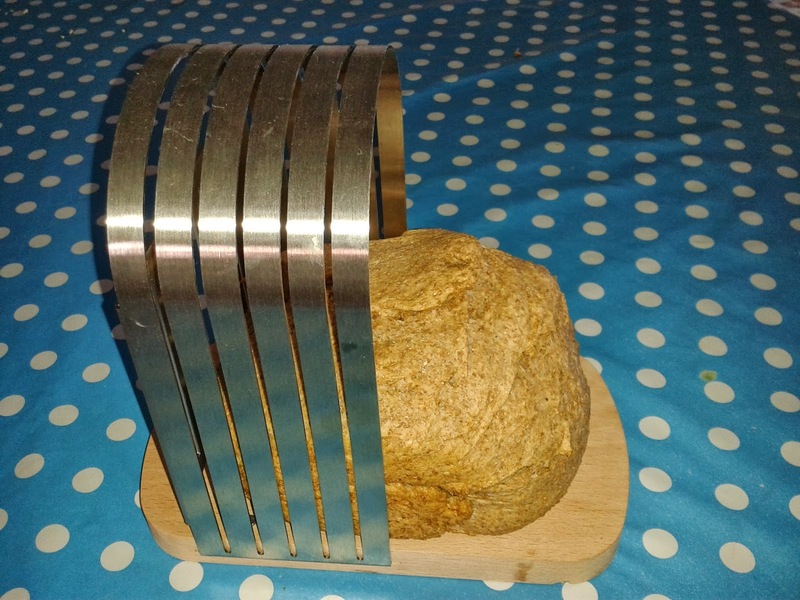 If you are interested in buying the Neat Bread Slicer and would like to help support this blog then click here. For more information about the slicer you can visit their website here. This entry was tagged bread, bread slicer, eco, Food, Frugal, Green, product review, thrifty, zero waste. Bookmark the permalink. Bread is very easy to make without a breadmaker which does make it very cheap. We make our own bread and freeze it too. That way you know exactly what is in it and you know its good when its only flour, yeast and water!! A dough hook on a machine makes it uber easy but I make it by hand too which can be great therapy! !